World figures have denounced Togo's army for suspending the constitution after the death of President Gnassingbe Eyadema and naming his son successor. While the constitution stipulates that parliament's speaker should take over in the event of death, the army swiftly handed power to son Faure Eyadema, 39. The African Union, currently keen to promote better governance on the continent, spoke of a "military coup". The UN, EU and former ruler France also demanded respect for the constitution. "The transition should take place in conformity with the provisions of the constitution, and with strict respect for legality, by the speaker of the national assembly," France's deputy foreign ministry spokeswoman, Cecile Pozzo di Borgo, told reporters. The request echoed one made by UN Secretary General Kofi Annan shortly after President Eyadema died - reportedly of a heart attack - on Saturday. For its part, the EU warned ties with Togo could suffer. "I call for the strict respect of procedures under the constitution," said EU Development Commissioner Louis Michel in a statement. "All other means will not offer stability to the country." By the time the death was announced on public radio on Saturday, the army had already sealed the border. It then handed power to Faure Eyadema, currently the communications minister. Army Chief of Staff Gen Zakari Nandja said the decision had been taken to avoid a power vacuum. The speaker of parliament, Fambare Natchaba Ouattara, who had been returning to Togo from Paris, was reportedly not allowed in because of the border closures. He is now in neighbouring Benin. 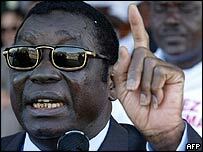 Eyadema, 69, Africa's longest-serving ruler, died while being evacuated for medical treatment abroad. After seizing power 38 years ago, he dissolved all political parties and governed unchallenged for more than two decades. He legalised political parties in 1991, as a result of popular pressure, and won three elections. But accusations of political repression and electoral fraud continued. African Union chairman - Nigerian President Olusegun Obasanjo - called Eyadema "one of Africa's greatest leaders", but added that that the AU would not accept any unconstitutional transition of power in Togo, his spokesman said. The BBC's African affairs analyst, Martin Plaut, says that while there was a time when such events in Togo would have attracted little attention, the installation of new leaders by soldiers is now supposed to be a thing of the past. It had been hoped, our analyst notes, that democracy rather than coups would be at the heart of African politics in the 21st Century. Indeed, it was Africa's promise to mend its ways that has furthered efforts to raise money for development, he says. Just hours before Eyadema's death, finance ministers of the world's leading industrialised countries announced plans to write off debt - in exchange for government reforms.